What do you need for a good crime novel series? Well, a compelling lead character and a great location, for starters, and Alex Segura has both. 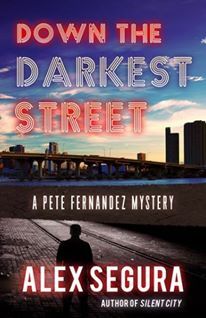 Down the Darkest Street is the second book in his Pete Fernandez series, and like the first book, Silent City, it takes place in Miami. It’s a Miami full of menace, grime, and dysfunction, hardly the tourist-image of the place, and it provides a wonderful setting for his tales that partake of both the noir and private eye fiction traditions. In Down the Darkest Street, the nascent detective career of Pete Fernandez continues. After what happened to him in Silent City, he should be dead. Both his personal and professional life are in ruins, and he has his ex living with him as her own marriage crumbles. He’s got enough to do trying to maintain a newfound sobriety, but into his life comes another complication, the call to investigate a missing woman who may be the victim of an icy killer cutting a trail of blood through Miami. Pete’s an unusual creation, a man we watch learning to be a private eye, a process that comes with messiness and grief. He’s a man who stumbles, retreats, and makes mistakes, but he doesn’t quit. Down the Darkest Street tells a tale of redemption and survival, and it has you pulling for Pete, despite his many flaws, all the way through. SCOTT ADLERBERG: Down the Darkest Street is the second novel in your Pete Fernandez series. You started it, of course, with Silent City. But when you started writing novels, branching out from your busy career in comics, what prompted you to write crime novels specifically, as opposed to glossy thrillers or fantasy or sci-fi novels? Why the crime fiction genre? 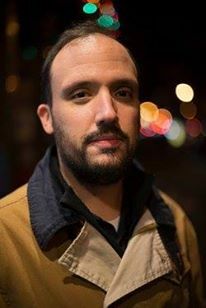 ALEX SEGURA: I'm not sure. Maybe it's the contrast? Hardboiled novels are at the other end of the spectrum from the four-color adventures of super-heroes and the like, though there's much more to comics/graphic novels than that. I've always loved crime stories, and that ran parallel to my passion for comics and sci-fi. I have a very vivid memory of reading The Godfather at eight or nine and just being in awe of the characters, the plot twists (Sonny!) and the grays that defined these "bad" people and made them good, too. It wasn't until my 20s that I got into the classics like Chandler, but even then it was just to entertain myself. I didn't seriously consider writing my own until I read more current authors like James Ellroy, George Pelecanos and Laura Lippman. I could finally relate more directly to the protagonists. They were screw-ups like me, and weren't perfect, didn't have a direct line to the police and might not even be actual, licensed PIs yet. That got me to thinking about the character that would eventually become Pete and about setting - I wanted to write a book that showcased the Miami I knew from living there, as opposed to the one you see in movies or TV, for the most part. I think I chose to go a more noir/hardboiled route, too, because I wanted something that was very different from my day job - not because of any unhappiness, but because it was different. I do think, though, that some of my other influences seep into the books. The main villain in Silent City isn't without comic book-like flair, for example. Though he’s not a licensed PI, Pete functions in the books as a private investigator. He’s not exactly Philip Marlowe or Lew Archer when it comes to competence as a detective, but he does know investigative methods from his days as a reporter. What I find striking is that he’s as flawed and troubled as many a noir character, even though he’s the one pursuing truth in the stories, and he inhabits a kind of hard-boiled world though he himself is hardly a tough guy or a great fighter. He’s an interesting person to follow as a series protagonist and I’m wondering how you developed your conception of him as a character. He's definitely not as polished as Archer or Marlowe, and that was by design. As much as I love those books, I knew I wasn't equipped to write one. And while reading those series, I was always curious about their early days - or, origin story, to go back to comic books. I wanted to show the beginnings of a detective, perhaps even before he knew he was going to become one. With Miami as the setting, I got to thinking about what kind of character would be interesting for me to write - and I knew I didn't want him to be a grizzled ex-cop or wiseacre PI out of the gate. I wanted to explore the idea of having a "normal" person - albeit one with a serious drinking problem, among other issues - get tossed into something bigger and more deadly than he's used to. Those are the two tracks Pete seems to inhabit. On one hand, he's dealing with these major, life-threatening things, like gangland killers, kidnappings and car chases. On another, he's battling his own demons - the loss of family, addiction, work and personal issues. And he can't solve one over the other. I think by the end of the first book, and definitely by the time you crack open Down the Darkest Street, you realize that they're very tangled together. The only chance Pete has of surviving as a detective is by solving his own issues. Easier said than done, though. Getting more specific about crime fiction, have you always been a big fan of private eye novels? I ask because I love them but have stayed far away from writing one because I’ve felt if I tried, I’d just sound like someone else who does it better. It’s crime fiction territory so well-explored….How do you approach it with the confidence you can bring something fresh to it? I've always liked them, definitely, but I also really loved standalone novels, too - especially the novels of Jim Thompson, Lippman and Ellroy, which I read a lot of when I was first getting serious about crime fiction. I think I've become more of a student of PI fiction after writing a few, which probably explains why I thought it'd be a good idea to create my own. I wish I had a better answer, but I think my logic behind doing it was because I wanted to, which sounds arrogant, I guess, but there we are. I didn't really know better, which I'm happy about, in retrospect. I also felt like having a unique setting and a character that didn't fit the mold of classic PIs was something I wanted to explore. I wanted a protagonist I could relate to - someone I felt like I may have known at some point in my own life. I wanted to also show that transition - from the first case to actually becoming a PI, which I hadn't seen much at the time I started Silent City. I'm also a sucker for redemption stories, and Pete's a fun one to explore. Here's a guy who's hit bottom, been written off by everyone, who now finds something that actually gets his blood pumping again. His old reporter instincts come back, he has something that motivates him as much, if not more, than the bottle and he's trying again. Whether he succeeds or fails is still to be determined, but I like rooting for him. I think the fact that he's not a street fighter or a polished investigator makes him more interesting. It definitely makes him more fun to write. You mentioned the comic book influence as something that helped you shape a couple of your characters. Can you think of other ways that comics, both your love of them and your work in them, has influenced your fiction writing? Definitely. Comics are so visual - when done right, there's a compactness to the words, and you ride along with the art to experience the story. You know the artist is a great storyteller when you can just look at the page and figure out what's going on without reading the word balloons. It's a tough note to hit, but when it works, it's great. In my own prose, I try not to over-describe. I don't really do a deep dive into what Pete looks like, for example. We know he has dark hair and sometimes sports a beard, but that's it. I'd rather leave a lot of that stuff to the reader, because I think it creates some investment. Plus, I don't like spending too much time listing what each person is wearing or what kind of art is hanging on the wall if it isn't relevant to the story - if it doesn't move things forward. It makes the novel a bit more collaborative, I think. The reader is engaged and part of the story. In comics, the writer and artist pool their talents to create something new, which they can't replicate alone. It's like being in a band, almost. You're not going to get that with novels, which are supremely solitary in terms of how they're created. But I do try to maximize the visual side of it. I think of each scene in terms of camera angles and what I want the reader to see, so when I do describe something it's emphasized in their mind as they read, as opposed to just doing the describing as standard operating procedure. So, yes, in that way comics play a huge influence - and movies do, too, to a lesser degree. Thinking visually and being mindful of what to focus on and when, comes from reading a lot of comics and writing some, too. I know that you’re very well-versed in music, and this knowledge comes through in both your novels. Pete’s often listening to music and thinking about music, There are many detailed references to a wide variety of songs and bands. Does Pete’s taste in music reflect your own at all? And do you see the music cited in the books as a kind of soundtrack to them? Do you listen to music when you’re actually writing? Pete and I have similar taste in music, I think. He listens to a lot of bands I loved in college that maybe I don't revisit as much today, like the Pixies or the Buzzcocks, and bands/singers I still play fairly often like the Replacements or Neko Case, to name a few. It's funny, though, because I don't listen to music while writing. I can't. I find it too distracting. I get caught up thinking about the song and who played what on the track. It takes me out of the writing. But I do think and listen to music a lot when outlining or just bouncing ideas around, and that's when I create playlists. I have one for each novel. I usually finish up the track listing after I've revised a draft or two, and try to keep it to the length of a regular CD (remember those?!). It's not exactly a one-for-one match to the songs mentioned in the book, though that might be fun to try, too. It's usually just songs I'm listening to or that I find particularly inspiring while writing. I listened to a lot of Sonic Youth and Nilsson while writing DTDS, for example. As you were getting at before, Miami itself is a character in both your Pete novels. You grew up in Miami and your knowledge of the city, the feel of the city, comes through strongly. But now you live in New York City so you’re writing about Miami from a distance And Miami, if it’s anything like most large American cities, must be changing in small ways all the time. How do you stay up to date with the city, its layout, its neighborhoods? It changes all the time, and I have to treat it like anything else I want to write about - I have to research. The Miami I grew up in is gone, and the current Miami is a city that's morphed and changed so much over the last few years it's almost an entirely new place. It's kind of exhilarating. I visit regularly, as I have friends and family there, so that helps. Even trips for fun can become research, and my wife has heard me say things like "This would be a great place to hide a body" more times than she's probably comfortable with. But I also have to get in the weeds and read up on what's going on. I try to keep up with the news and jot down anything interesting that might work in a book, but yeah, it's a challenge. If I was still living there, it might be a bit easier. I'm sure, at this point, it'd be easier writing a New York story. I've lived here over a decade. But I think Miami is such an important part of Pete and of his adventures that it'd be weird for me to move him here or change gears like that. It doesn't mean I won't have Pete experience things outside of Miami, though. You want to stay true to the series while defying expectations and keeping readers on their toes. From all indications, you’re going to be sticking with Pete Fernandez novels for some time to come. Do you have a specific, finite number of Pete books planned, or are the plans now open-ended, to let the series grow and just see where it goes? Any plans for a standalone novel in the future? No immediate plans, though I do have a few ideas jotted down for a standalone novel. The third Pete book, Dangerous Ends, hits next year and I'm in the process of revising that. I'm halfway through the fourth book, too. That one would probably serve as the best break, but it's too far into the future to make concrete plans. So, I'll be hanging out with Pete for a while, which is fine by me! Scott Adlerberg lives in Brooklyn. He's written the Martinique-set crime novel SPIDERS AND FLIES and the novella JUNGLE HORSES. Each summer, he hosts the Word for Word Reel Talks film commentary series in Manhattan. His new novel, GRAVEYARD LOVE, a psychological thriller, is out now from Broken River Books.